This is an addendum to my earlier post on P.F. 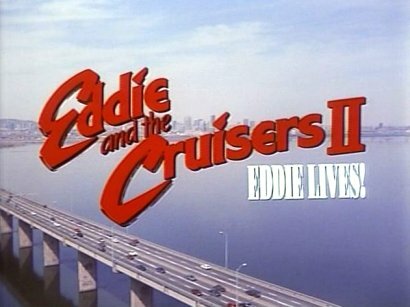 Kluge’s novel Eddie and the Cruisers. And I swear it’s true. In the late 1980s I worked in Florence, Alabama for the Olan Mills Portrait Studio chain. The studio manager was a woman then in her mid-forties, and one night just after closing our conversation turned to how much I liked the music from Eddie and the Cruisers. This woman, old enough to have lived through the period when the fictional band ruled the charts, believed Eddie Wilson was real. Somehow the presence of the film on cable and the music on the radio had placed this fictional character alongside Elvis and the Beatles in her memories. I didn’t disavow her of her delusion. It seemed pointless. Her sympathy, however misplaced, was certainly real. But at that moment I realized the power of pop culture: much like the Force, it can have a strong influence on the weak-minded. Has anyone else ever encountered someone who believes a patently fictional character was/is real? Having worked in a bookstore in Nashville for years, I can't tell you how many times I had to explain the difference between fiction and non fiction. Probably the biggest confusion amongst the buying public came around the time of James Cameron's Titanic. Our Titanic display was two-sided, with ficitional stories on one side and non fiction on the other. 100 years of historical fiction, combined with the reprinting of actual memiors of Titanic survivors served only to blur lines for those who thought that the characters onscreen were factual, and that the movie represented a true story. That I would patiently explain that yes, Mollie Brown was real, but that Jack and Rose were not, only made me look like an idiot in the eyes of those convinced that hearts must go on. They never understood why some accounts (historical fiction) were shelved next to the movie books, and some were shelved on the other side next to books filled with images of the very real sunken ship (memiors). The line between truth and fiction didn't matter to these customers, because all the events were equal in their eyes. No, but a cousin, hearing my new WIP had vampires in it, asked if it was a self-help book. I'm still pondering that, thinking there might be a new genre to pioneer. Then again, she lives in Guin, Alabama, not so very far from Florence, so it might be in the water. Not quite the same, but after my mother finished reading The Da Vinci Code, she was furious at the Catholic Church for its centuries-long cover-up. However he did it, Dan Brown convinced a lot of people that the conspiracy is real while the characters in the story are not. As my mom said, "He's just exposing the real story by calling it a fiction because he's trying to protect himself."